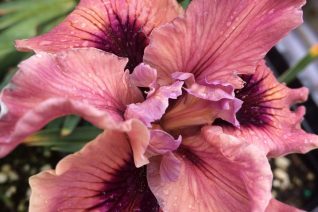 Astonishing flower color is one reason to love this large flowered Pacifica hybrid. Orange/coral/pink all morphed into one hue with a central zone of deep purple near the center. To 1′ tall and forming spreading clumps of evergreen foliage. Blooms April-June. The large flowers are showy from quite a distance. Part shade is ideal but endures full sun and tolerates total shade. Water regularly through the first summer to establish- the clump should increase by twice its size then none in subsequent years. Resents disturbance best left where it is to live. Great deer resistance. A very unusual color for a PCI. 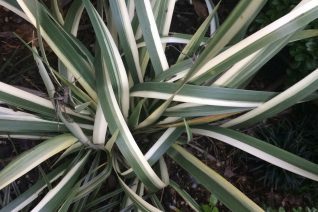 Useful, pretty foliage plant in a genus most known for flowers. The 1.5″ wide leaves are striped in white and dark green. Each evergreen leaf rises to 15″ and then arches over. In time it forms large showy clumps. In late spring small not very striking brown flowers appear and are followed by much more showy orange berries that appear in fall and persist. To 2′ wide in time. Part shade and rich soil with regular summer water. Avoid blasting hot locations and dry, compacted soils. Great winter appearance and totally hardy to cold. Limited quantities. Excellent deer resistance. 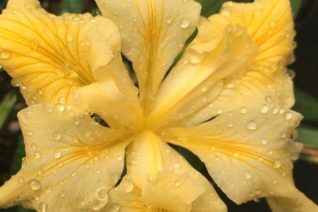 Yellow is a special color for Pacific Coast Iris and this selection does a great job at producing profuse large luminous yellow flowers for an extended period. To 14″ tall and forming spreading clumps. 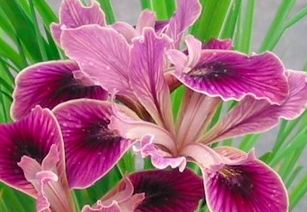 The vivid flowers are showy from a distance and resonate with the candy-like colors of other Pacific Iris. Mix with ‘Blue Moment’ for a classic blue and yellow combination. 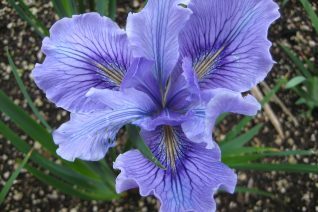 This Iris also blooms simultaneously with the clouds of blue flowers of Ceanothus. And they appreciate the same cultural conditions- a late spring vignette that gets by on no summer water! Evergreen. Not fussy about soil. Water consistently through the first summer to establish (established Iris will double their clump size in the first summer). Then only what falls from the sky in subsequent years. Heavy bloomer in April-June. High deer resistance. Our first deliberate cross of two Pacifica species has yielded a real looker. Half Iris innominata and half Iris tenax. 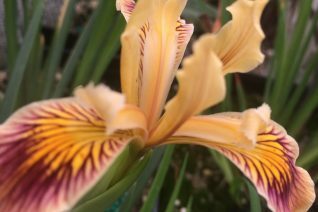 It inherits the incredible amount of flowers from the first parent which is yellow and more intricate markings and purple hues of the latter. Fun to grow colony producing grassy iris for full sun to part shade. Begins blooming in late April and continues for 3 to 4 weeks. Adaptable to many types of soil, including clay soils. Water regularly through the first summer to establish then none in subsequent years. This little iris ( to 8″ tall) is very wild looking and reminds us of natural hybrids that occur in the wild. In time when you have many flowers per clump it makes a charming cut flower. Two Oregon native perennials. Heh. High deer resistance. Oregon native plant. 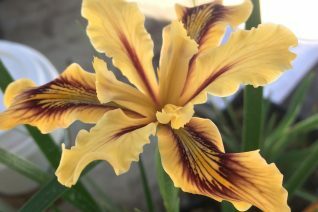 This is our own seed strain of Pacific Coast Iris. We save from specific plants and aim to include as many unusual colors as possible. Typically 1/3 are deep purple, 1/3 are amber/yellow and 1/3 are combinations of the two- whats left is the odd deep blue. Full sun to part shade in any reasonably well drained soil. Adaptable to clay. Regular summer water for the first year to establish then none in subsequent years. Blooms appear from late April through May. Height is variable but all make large clumps of grassy foliage over time. 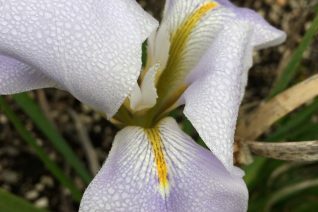 Do not disturb once established and remember that Pacific Coast Iris thrive on neglect. Excellent and wild looking cut flowers. Highly deer resistant. Xera Plants Introduction. The plant pictured is an example of an Amber seedling. Oregon native plant. Pacific Coast Iris can be dodgy to divide. You have to do it at the exact correct time in the fall just before they grow roots for the new year. Even then it takes a careful and gentle hand to produce viable divisions that will grow on and bloom. ‘Little Survivor’ must get its name from its ease of division. Either way its a fantastic PCI that begins blooming in late April and continues almost to June. Red and raspberry colored flowers are dramatic on a very compact plant to just 10″ tall. Grassy evergreen clumps of foliage do not obscure these precious flowers. Full sun to quite a bit of shade in any soil with reasonable drainage, including clay soils. Water for the first season to establish then none in subsequent years. Highly deer resistant. Long lived. Do not disturb once established. Neglect is its friend. How can you not fall in love with a blue iris? Its so classic. This vigorous and easy to grow Pacific Coast Iris does blue very well. The large sky blue flowers are marked in the center of the fall with more intricate yellow and black hatch marks. Large growing PCI to 16″ tall and forming imposing clumps of tall evergreen foliage. Blooms late April through May. Full sun to part shade in any soil that drains. Not fussy but dislikes standing water. Water though the first summer to establish then none in subsequent years. Evergreen foliage is nice looking- dies down a bit in winter and returns in spring. Highly deer resistant. Of the 11 species of Pacifica species on the west coast the species I. munzii from the central Sierra Foothills imparts the best blue flower color. 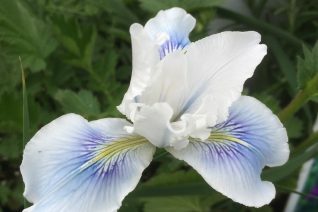 Typically a tall growing species to 16″ this cultivar creates amazing large flowers of soft washed blue with ivory edges. A very pleasant color that shows up well in gardens. Full sun to part shade in rich to average soil. This cultivar likes a bit more drainage than others- a product of its I. munzii parentage. Blooms late April through May. Upright grassy deep green foliage is evergreen and forms large clumps over time. 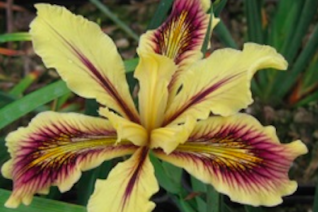 Best with a good amount of neglect as all Pacific Coast Iris demand. High deer resistance.